In 2013 we provided a loan to CPNCK, the coffee cooperative on the island of Idjwi. It enabled their first ever export of a container of coffee. At that time only one other cooperative in Kivu had managed the same feat since war decimated the coffee industry back in the 90’s. 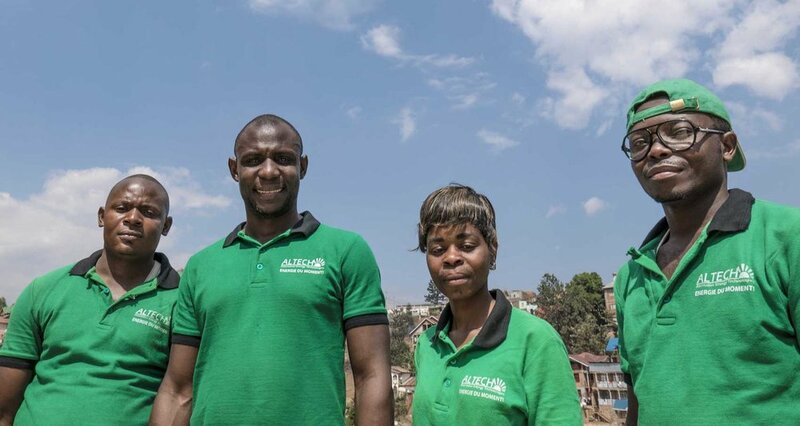 In 2014 we offered a loan together with business advice to Washikala and Iongwa for their renewable energy business called Altech, and we still do both. We are working with them towards a target of benefitting 2 million households. We support a fish farmer in Kivu called Sifa. She sells her monthly catch to shops and restaurants in the city. We understand that live fish from China, which is available in the markets, travels for three months. Sifa’s fish is fresh and she pays wages to local workers at her farm. We started working with ADPA in 2014 with a loan to fund an order for 450 tonnes of rice. With our continued support this now rests at 1000 tonnes. Approximately 5000 rice growers now supply ADPA, which means that approximately 30,000 children have felt the benefits. A move forward for people who have suffered decades of conflict and poverty. Shalom is a group of women who design, produce and sell colourful fabrics called Buisa that are used locally for dressmaking. In 2015 and 2016 we proved loans to increase production and upgrade buildings and facilities. The financial benefit to the women and their families is very tangible. There are very few jobs in Mudaka and working at Shalom carries prestige. During an extremely collaborative four year relationship, Ensemble and Innocent Misabiro have grown his business, Liaison Congo. He now runs two internet cafes for everyone from kids and adults learning computer skills to university students looking to study and use social media. He wants to bring the benefits of the internet to everyone in Bukavu. Olivier Maheshe runs Kivu Leather, the only business making shoes and sandals in Bukavu. Before our collaboration he worked with three employees in a makeshift workshop in a poor area of town called Kadutu. With our support he has moved to a spacious workshop in Nyawera and now employs 12 people and makes around 2000 pairs of shoes and sandals a month. Dr Pascal set up a hospital in Kavumu, a town in a poor region. In 2014 we provided a loan for equipment. In collaboration with Fjord we installed a patient management system called OpenMRS. It required a solar-powered LAN and server and tablets for the staff. The hospital now has a reputation that has spread far and wide. Patients travel up to 80 km to be treated, which in Kivu is a long and arduous journey.